Product information "Trolley - Kids Luggage, Adventure Bus"
description & equipment Ready for exciting discovery tours: LÄSSIG’s practical Trolley from the Children’s Adventure Collection in the tipi or bus design, will make packing for your next adventure super easy. Clothes can easily be neatly packed in the main compartment and held in place by two securing straps. 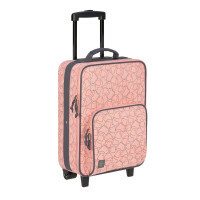 Shoes have their own spot in the practical shoe bag that belongs to the travel set. 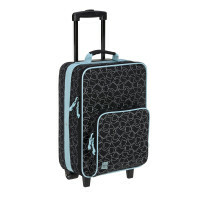 On the outside, a zipped front compartment and a side pocket offer even more storage space. The practical telescopic handle can be adjusted to two-positions and a small clear name badge sleeve ensures that there won’t be any mix-ups. The water-repellent outer material makes the Children’s Trolley a cool travel companion in any weather. 'Pimp your bag” – special design feature. 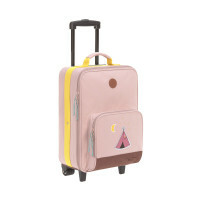 Three fabric stickers come with each suitcase in the trendy Adventure design, so children can create their own designs. There are no limits to creativity and fun. The fabric stickers can be used several times by taking them off and putting them in a different spot. 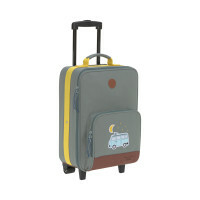 Warm earth tones and yellow color accents on straps and handles make the children’s suitcase a real eye-catcher. The Trolley is also available in the various designs of LÄSSIG’s other Children’s Collections.